"The goal of this campaign is to make the parishes stronger because the life of the Church happens in the parish- the diocese is as strong as its parishes." 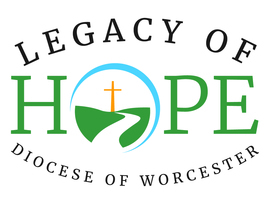 The Legacy of Hope Capital Campaign will provide the solid foundation upon which our Church will continue to build and enhance the future for Catholics across the Diocese of Worcester. Financial resources are essential to enable our parishes to continue supporting the journey of faith, spirituality and ministry of our expanding Catholic community. Funding local parish needs determined by parish leadership. Forty percent of every dollar raised will return to the parish up to the assigned goal. Once the parish surpasses their goal, 60% of all funds above and beyond will be returned. The current Priests’ Retirement Endowment has faced a shortfall over the past six years. Through this campaign, we aim to expand the endowment to ensure that we take care of our priests in retirement. Helping more families attend our Catholic Schools by growing our Catholic School Endowment. Currently, only 20% of the need is met. Through this campaign, we can assist 150-200 more families, providing their kids with a Catholic Education. Funding localized social and charitable outreach including but not limited to: food pantries, elder outreach, youth drop-in centers, homeless shelters, addiction support, etc. Assisting parishes with evangelization initiatives including but not limited to: alpha, bible study, CHIRP, Cursillo, life teen, Light of the World, RCIA, SEARCH, youth ministry, etc. Renovating and structural repairs including the bell tower and pews. As we embark on the Legacy of Hope Capital Campaign, we look forward to the future, confident that all of our Brothers and Sisters of Christ will consider a sacrificial gift and join together to raise these important funds.